Last night, Alexandre Trudeau was in town to promote his new book Barbarian Lost. The event took place at Library and Archives Canada during the Ottawa International Writers Festival. The author first read an excerpt and then was interviewed by Adrian Harewood. Alexandre Trudeau has always been fascinated by China and attracted to its people, history and culture. It all started when his father, late prime minister Pierre Trudeau, came back from a trip there, bringing back captivating tales and exotic souvenirs. The author’s own first journey to China was during a formal trip with his father when Alexandre was 16. Since then, he has been there a dozen times. His last trip lasted 6 weeks and is the basis of the book. He was accompanied by a translator, Vivien, who prefers to remain anonymous, even though she doesn’t live in China anymore. She helped him tremendously, and he praised her candor and courage. 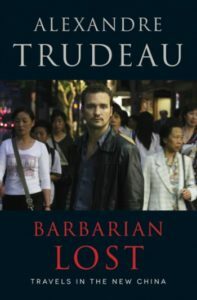 In Barbarian Lost, Alexandre Trudeau explains that the Chinese are generally happy and amazed by their new freedom, especially the younger generations. Even though most of them work in factories from the age of 15 to 40, they are not complaining about their situation. In fact, they are hard workers, careful with their spending. Most of the young adults live in big cities where a lot of construction is happening right now. Cranes pop up everywhere, and workers labor 24/7. Modernity is emerging, and the old China is almost completely gone. However, the author thinks that this country has a lot of progress to make in politics. The Chinese are mostly apolitical because, not so long ago, they could be arrested, tortured or killed if they had different ideas. In fact, they usually don’t like to talk about Mao Zedong or the past in general. Furthermore, the Chinese often see themselves as victims from the West. Be that as it may, change is happening slowly. Alexandre Trudeau calls it the “quiet revolution”, and he is very hopeful for the country’s future. When he was younger, the author thought books were antiquated, and that is why he chose to be a filmmaker. “Now I think I was too hard on books,” he says. He realized that films were more fleeting, and that there’s a certain freedom in writing. Hopefully, this won’t be his last book then because it would be a shame to lose such a talented and interesting writer! Pierre Trudeau also wrote a book on China called Two Innocents in Red China. The late prime minister affectionately called his children “barbarians”. Justin’s favorite chapter is the one where Alexandre is on a boat on the Yangtze river. The author actually had trouble writing this passage because he gets depressed on boats. 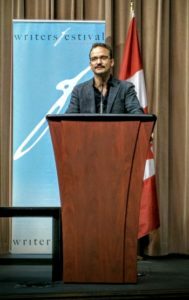 Alexandre Trudeau calls himself a “radical pacifist”. He likes danger for its own sake, and he believes it allows him to know what he is made of.